June 1, 2018, 9:48 a.m.
By Samm Farai Monro June 1, 2018, 9:48 a.m.
Editor’s note: This is the last in a series of stories on how online satirical outlets around the world develop their shows and sites under difficult national conditions and repressive, authoritarian governments. This Nieman Lab series is based on a selection of ISOJ presentations from several organizations and includes material from additional follow-up interviews with some of these panelists and additional writers and producers of the shows profiled here. The text that follows is in the humorists’ own words. Check in each day this week to see how the Middle East’s Al-Hudood, Zimbabwe’s Magamba TV, Venezuela’s El Chigüire Bipolar, Bosnia and Herzegovina’s Satro Info, and Kenya’s The XYZ Show develop new audiences, how they’re thinking about the humorist gender gap among in their countries, and how they work journalistically, in many ways achieving the types of impact often associated with journalism. Up today: Magamba TV, which produces several satirical political shows, including a forthcoming all-women show, with female producers, director, scriptwriters, and voiceovers. Samm Farai Monro: How do you resist the authoritarian regime of Robert Mugabe? Some take to the streets. Others write articles. We decided to take the sophisticated and intelligent route of taking a piss out of the government. More specifically, taking the piss out of ZBC, which is state-controlled and the only TV station in our country. In Zimbabwe, we tend to like things in ones: One TV station, and one president for life. This clip shows our program Zambezi News, where we have bungling newscasters who parody ZBC, issuing hilarious propaganda. We started that in 2011, at a time when social media and the Internet weren’t big in Zimbabwe. So we went old school and produced tens of thousands of DVDs to distribute throughout the country, because for obvious reasons, the only TV station wouldn’t broadcast us. We distribute over 10,000 DVDs of the first season, and we got overwhelming feedback, and really positive feedback. But the best feedback we got was from one viewer who wrote to us saying, “I can’t believe this is the state of our national broadcaster. I can’t believe their standards have sunk so low.” We turned to each other and said, we have achieved our dreams — people think we are ZBC. We can quit now. Zambezi News is now five seasons in. We’ve reached over 2.2 million households in southern Africa through satellite television. We’ve been featured on CNN, the Guardian, on Channel 4, and so on. We believe we’ve been at least part of inspiring a new political satire movement in Zimbabwe. When we started in 2011, political satire wasn’t exactly a thing, for obvious reasons. Since then, the Internet and social media have become much more widespread. Out of a population of 13 million, we have five million Zimbabweans with some form of access to the internet. So since then, we’ve also come up with a new program called The Week, which is kind of a political roundup of the burning political events that have happened, and we’ve done this exclusively for the YouTube generation. We distribute this on Facebook, YouTube, WhatsApp. It’s got us in a lot of trouble, but also reaches a big youth audience in Zimbabwe. We had over 1.5 million views on Facebook in 2017. Facebook is our primary distribution platform, where we can reach up to 400,000 viewers per season. We’re now on Instagram, too, as Magamba TV. Re other channels: We’ve got a deal with Germany’s Deutsche Welle for a new show about the “Minister Of Impending Projects.” And we’re soon to have another show commissioned for a new African mobile-first TV channel. Magamba Network has a total of 20 team members. When shooting The Week we work with a crew of five; for a season of Zambezi News we are more like 40 to 50 people, including crew and talent. Our main revenue streams are (1) funding from foundations, (2) corporate sponsorship, and (3) income generated through TV distribution deals, commercial video production and the like. I’m sure you’re asking, how do you get away with this? I’d like to categorically state that in Zimbabwe, we have freedom of expression, we just don’t have freedom after expression. People always ask, when do you know you’ve crossed the line? Do you have a line? And it’s quite difficult to know what that line is. On the one hand, we know that quite a few government ministers actually watch our stuff. I was at a big media conference and the minister of information, communication, and technologies was making a speech there. It’s Q&A time, and I ask him a question, and he goes, Comrade Fatso, I follow you. And you worry there: Do you mean follow in the old school sense, with dudes in dark glasses and suits? He was like, I follow you on social media, and I find some of your clips quite entertaining, and some of your criticism quite enlightening. So these dudes, they do watch it, to get a sense of what young people are thinking. But you never know when you’ve crossed a line. We did a special on former president Mugabe’s birthday, on how his cake cost $1 million, and so forth. The week after, city council arrived and tried to demolish our offices. By the middle of 2017, police were threatening to shut down our festival were we had people performing political comedy, and by the end of the year the state arrested our Magamba TV producer Martha O’Donovan, who is in charge of all our political satire. They accused her of trying to overthrow our government. They locked her up in high security prison, and soon after that they raided our offices and confiscated our laptops. This was all happening at a time when tanks were rolling into our streets. A coup apparently was about to start. We went into safehouses, woke up the next morning, and on TV was a general who’d taken over ZBC, saying the situation has gotten to another level, but “this was not a coup,” it was a military-assisted transition. We rushed back to our offices to shoot a new episode of The Week. That new episode, called “This is Not a Coup,” has become our most popular one to date. We’ve currently started producing 2 brand new shows: (1) A new Africa-wide satire show incorporating contributors from different African countries and (2) our first animation series with a women-driven team and content. This is an all-women led political satire project with a female producer, a female director, a female scriptwriter, female voiceovers. We come from quite a patriarchal society. The lack of women’s representation is structural. As satirists and as media activists, it’s about taking conscious efforts within your organization to make sure you’re giving space to women’s voices. On our show The Week, the director and editor is a woman. On all of our satire shows, a woman is the producer. We are consciously moving to getting more women script writers and comedians involved. You’re not going to combat sexism if you don’t take active measures against it. POSTED June 1, 2018, 9:48 a.m.
Monro, Samm Farai. "How Zimbabwe’s Magamba TV produces political satire for a new social media-connected generation." Nieman Journalism Lab. Nieman Foundation for Journalism at Harvard, 1 Jun. 2018. Web. 18 Apr. 2019. Monro, Samm Farai. "How Zimbabwe’s Magamba TV produces political satire for a new social media-connected generation." Nieman Journalism Lab. Last modified June 1, 2018. 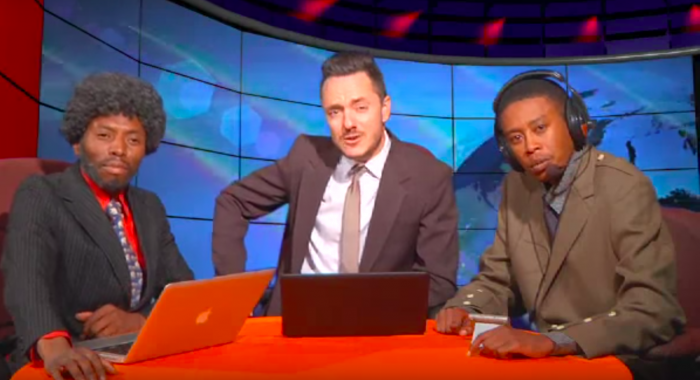 Accessed April 18, 2019. https://www.niemanlab.org/2018/06/how-zimbabwes-magamba-tv-produces-political-satire-for-a-new-social-media-connected-generation/.